an avenue for learning tools to navigate intimate relationships with yourself, others, community, and spirit. an opportunity to cultivate deep joy. There are many forms of conscious dance. Some are based on a connection to an ecstatic experience, others are based in mindfulness, and still others are based in deep shamanic trance. Whatever the pathway, conscious dance is, at its core, about a person's embodied awareness, and cultivating home in one's spirt and soul. Conscious dance can be done by anyone regardless of physical ability, fitness or prior dance experience. 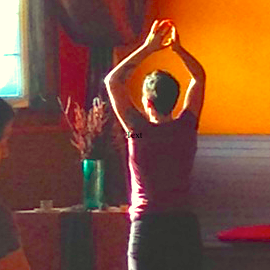 At Presence Studio, we practice all three of these states–the ecstatic dance, mindfulness practice, and shamanic trance–in order to bring the resulting learning into cellular knowledge in the present moment. This "wholing" of body, mind, and spirit benefits us in our everyday lives. Open Floor is the main practice offered at Presence Studio, a rich, matriarchal format for dynamic change.